Where are suit for Drill Free Tech? Where are not suit for Drill Free Tech? -Please follow the steps in the "Product Install". -Important to use our temporary one-time adhesive tape for holding the product no less than 1 min. No Drilling:can be installed in any smooth surface as ceramic tiles with no dirll. Self adhesive with the glue and the temporary one-time tape. Please hold on 5 minutes at least and don't put anything on the shelf within 72 hours. Heavy Duty: All solid metal construction, ensuring quality and longevity. Rustproof: Construted of Type 304 premium grade stainless steel, Brushed nickel finish, build to resist daily scratches, corrosions and tarnishing. to protect against corrosion & rust. Easy Removeable and Re-install:no damage to your wall. You can remove the bath shelf off the wall with a blade, and reinstall in other room by the super glue or neils. Modern Design: Beatiful classy looking. 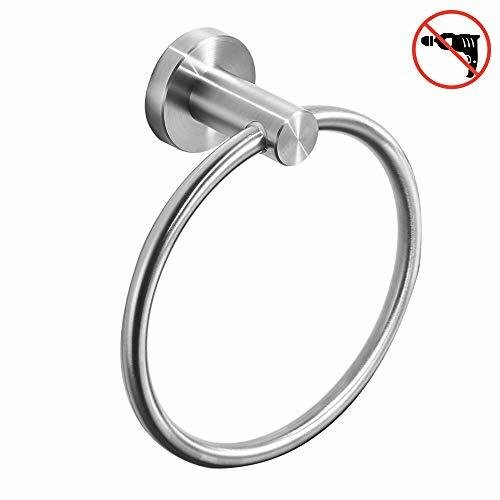 View More In Bathroom Hardware & Installation. If you have any questions about this product by BESy, contact us by completing and submitting the form below. If you are looking for a specif part number, please include it with your message.